On March 13, the White House released a statement entitled, “What You Need to Know About Sanctuary Cities,” outlining what the term sanctuary cities refers to and why they believe them to be dangerous. On the same day, a federal appeals court upheld most provisions of a controversial Texas law that prohibits sanctuary city policies in the state. The bill, referred to as SB4, established civil penalties for local government and law enforcement officials who don't comply with immigration laws and detention requests. It was blocked by a lower court in August, just before it went into effect. This comes just a week after the Justice department sued California; Gov. Jerry Brown; and the state’s attorney general, Xavier Becerra, over three state laws passed in recent months, saying they made it impossible for federal immigration officials to do their jobs and deport criminals who were born outside the United States. The Justice Department called the laws unconstitutional and asked a judge to block them. 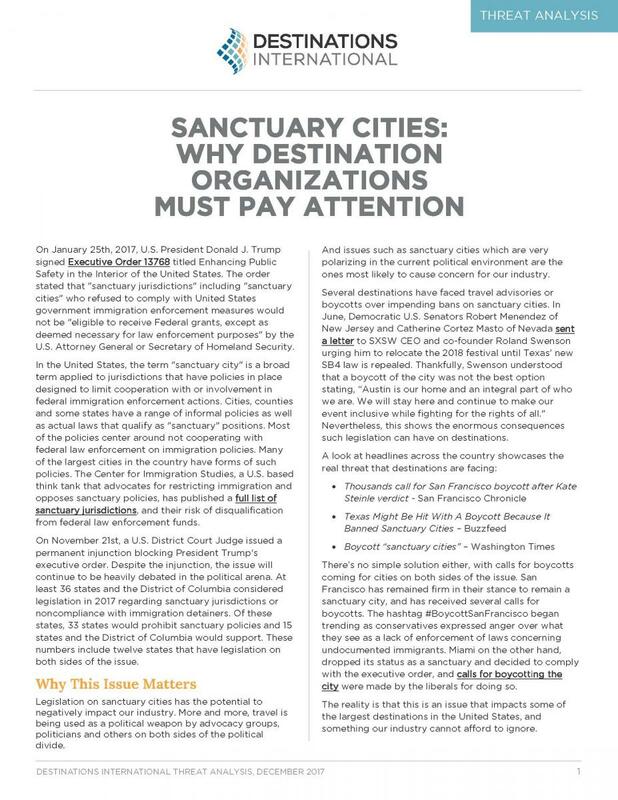 As we outlined in our Threat Analysis released last December, “Sanctuary Cities: Why Destination Organizations Must Pay Attention,” destination organizations need to be paying attention to these conversations. 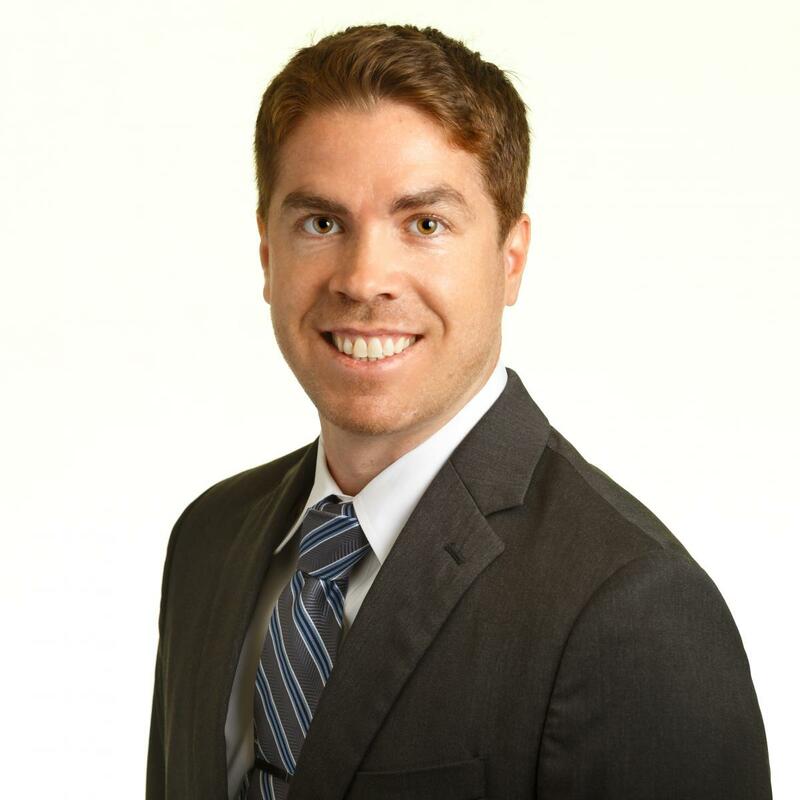 Legislation on sanctuary cities has the potential to negatively impact our industry. More and more, travel is being used as a political weapon by advocacy groups, politicians and others on both sides of the political divide. And issues such as sanctuary cities which are very polarizing in the current political environment are the ones most likely to cause concern for our industry. Several destinations have faced travel advisories or boycotts over impending bans on sanctuary cities. In June, Democratic U.S. Senators Robert Menendez of New Jersey and Catherine Cortez Masto of Nevada sent a letter to SXSW CEO and co-founder Roland Swenson urging him to relocate the 2018 festival until Texas' new SB4 law is repealed. Thankfully, Swenson understood that a boycott of the city was not the best option stating, “Austin is our home and an integral part of who we are. We will stay here and continue to make our event inclusive while fighting for the rights of all." In fact, SXSW held a session on “Redefining Sanctuary Cities” this week during their inaugural Cities Summit. Nevertheless, this shows the enormous consequences such legislation can have on destinations. There’s no simple solution either, with calls for boycotts coming for cities on both sides of the issue. San Francisco has remained firm in their stance to remain a sanctuary city and has received several calls for boycotts. The hashtag #BoycottSanFrancisco began trending as conservatives expressed anger over what they see as a lack of enforcement of laws concerning undocumented immigrants. Miami on the other hand, dropped its status as a sanctuary and decided to comply with the executive order, and calls for boycotting the city were made by the liberals for doing so. The reality is that this is an issue that impacts some of the largest destinations in the United States, and something our industry cannot afford to ignore. For a more in depth review of the political conversations taking place around the topic of sanctuary cities, download our Threat Analysis.